School supplies and backpacks are popping up everywhere I look. It’s almost enough to make me wish I were still a student. My nostalgia brings with it memories of picking out elaborate Trapper Keepers and deluxe sets of Crayola markers. Of course, for many children, the apprehension that accompanies the start of a new school year is enough to have them faking a bad case of stomach flu. Here are two of my favorite books that address some of the not-so-pleasant aspects of elementary school days. “Butterflies in My Stomach,” written and illustrated by Serge Bloch, helps take the edge off back-to-school jitters with its laughable literal translations of the common but confusing figures of speech a child encounters on his very first day of school. “Has the cat got your tongue?” his teacher asks. “Why the long face?” the school cook inquires. “I’ll keep an eye out for you!” the nurse promises. 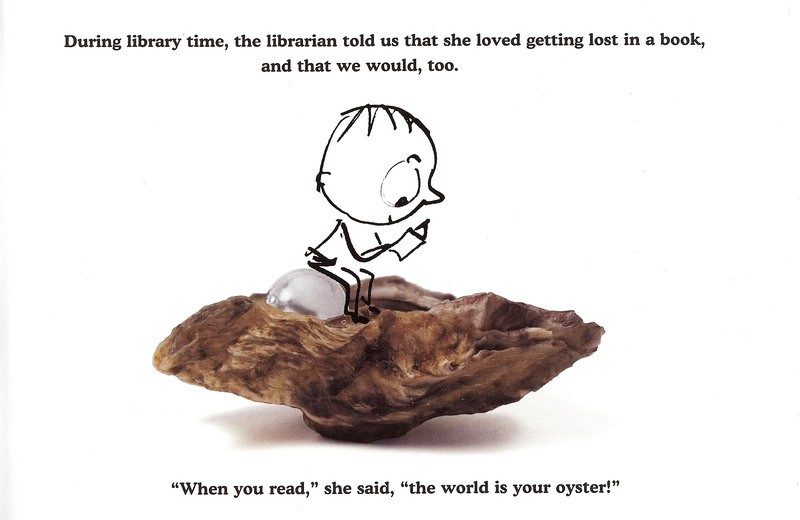 Bloch uses almost-childlike pen and ink line drawings, combined with photographic elements, to cleverly illustrate the boy’s interpretations of these turns of phrase. And the images, in turn, provide fun visual aids for explaining the meanings behind the idioms. Most importantly, the little boy’s story can help school-aged children realize they’re not alone in their anxieties about the bewildering new world of education. Bloch’s adult characters promise sympathetic guidance and the book’s ending has a silver lining… again, literally. But sometimes a student’s worries are more than just butterflies in his stomach. Sometimes there’s a real live bully lurking in the shadows of the playground. Enter Mean Jean. “The Recess Queen,” written by Alexis O’Neill, authentically captures the intimidating social hierarchy of the schoolyard, which bears a striking resemblance to the operations of a mob ring. 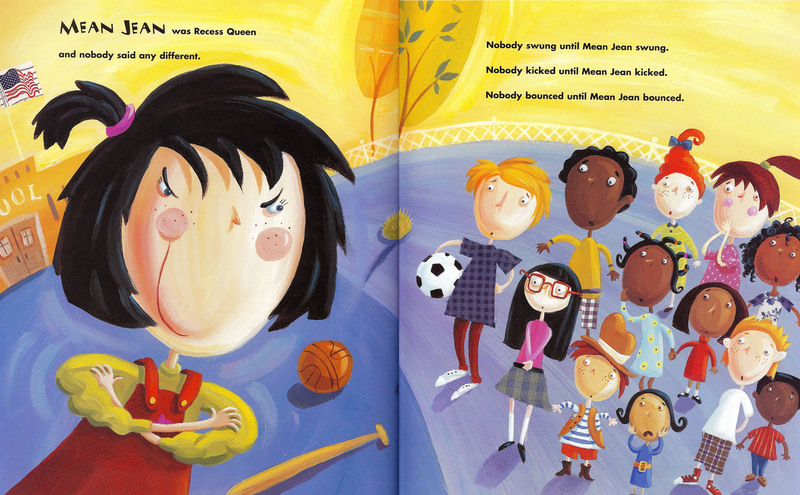 Mean Jean, a tough, freckle-faced girl, rules with the authority of a dictator, and nobody says any different. With the enlightened perspective of a former elementary school teacher, O’Neill’s rendering of the bully is pitch-perfect. I think we all had our Mean Jeans growing up, although my husband claims recess bullies may have been more of a “girl thing.” I certainly remember being excluded from the jump rope clique ruled by a certain recess queen I’ll call Mean Jodi. The twist in this story comes when a new student joins the class. Katie Sue is too green to known about the Recess Queen, so she swings before Mean Jean swings, kicks before Mean Jean kicks and bounces before Mean Jean bounces. You can imagine the havoc that ensues. But rather than cowering to the Queen, Katie Sue invites Jean to jump rope and we learn that no one had ever asked her to play before. In all likelihood, most real-life stories involving bullies will not end as simply and happily as Mean Jean’s. But the book can provide the perfect prompt for you to add your own afterward, explaining to your children, for example, that the bullies who once picked on you have since turned in to loser adults.